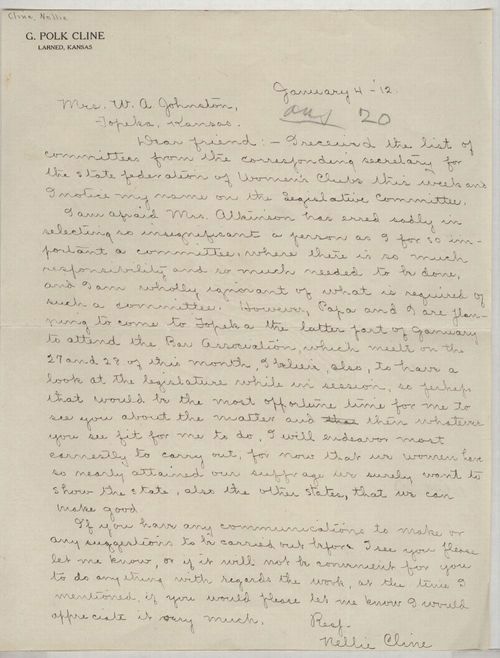 In this letter, Nellie Cline writes to Lucy Johnston regarding Cline's nomination as a representative on the legislative committee of the State Federation of Women's Clubs. Cline did not feel that she was qualified for the position and wanted to speak with Johnston in person. Cline did, however, feel that it was a very important position within the club movement because "now that we women have so nearly attained our suffrage we surely want to show the state, also the other states, that we can make good." Nellie Cline would later be elected to the Kansas House of Representatives and would serve from 1921 to 1924. This letter could be grouped with the photographs of Nellie Cline and Lucy Johnston. It effectively illustrates how women took their roles in government very seriously, even before they obtained the vote, as they were aware of how their critics perceived women who involved themselves in politics.